No, no, Betas isn't a sequel or spin-off of the defunct SyFy Channel show Alphas, although you'd be forgiven for not knowing otherwise. 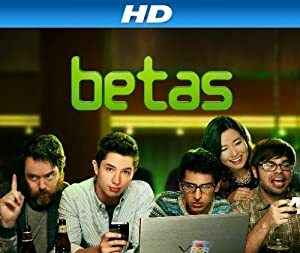 Instead, Betas is one of the two inaugural series from Amazon Studios (along with the Congressional satire Alpha House), in the web mega-colossus' attempt to get in on some of that yummy, yummy Netflix original programming business. Since it'll take a minute to get back to the show itself, let me just say for now that it's surprisingly, tremendously, good. Backing up: you may remember that in April of 2013, Amazon posted 14 pilots online and asked the site's visitors to watch and review them, thereby determining which would be greenlit for an entire season. To me, it seemed like a dumb way to do things, and the whole Amazon Studios model made a lot of people nervous. The "studio" had begun by soliciting scripts from non-professional writers and encouraging them to more-or-less sign their rights away in a nebulous quagmire of "collaboration" where other writers or site users could suggest and even make changes to a writer's work. They got in trouble for this, and were pressured to change how they went about doing things. So when they announced their pilots, I and many others didn't have high expectations. Plus, I figured the fix was in anyway for high-profile projects like the TV spin-off of box-office winner Zombieland. But then Zombieland didn't make the cut. And two shows that seemed interchangeable on paper — Betas and Browsers — felt like Amazon was making the same mistake the networks did a couple of years ago with their glut of shows about "guys learning to be more like men," but this time it was "if we make enough shows about twentysomethings and technology, one is bound to stick." Thankfully, Betas was the one that made the cut, because it has risen above even the most generous of expectations. The show centers around the small team behind a start-up dating app in Silicon Valley. The pilot introduced us to the character types the show staked out — the straitlaced main character and team leader, his quirky, awkward best friend, the pudgy, inappropriate guy, and the girl that hangs out with them. Not thrilling stuff, but competent. Excellent TV comedies will begin with such character types, and slowly reveal more and more humanity in the characters. Over a few seasons, they begin to feel real, and we begin to care about them beyond how often they make us laugh. Think of the evolution of someone like Michael Scott on the American The Office or Marshall on How I Met Your Mother, who got to experience real emotions and tragedy inside a relatively safe sitcom. What's remarkable about Betas is how stunningly fast the show's creators have been able to get their characters to that point. By episode six or so, each character had been given a central role in a particular episode, and none of the characters or the actors portraying them squandered their opportunities. The tech setting is interesting and the evolution of the team's business is an engaging part of the show, but the deft character exploration is really where it shines. There is no sitcom in memory that has made me feel for and root for its characters as quickly as this show has. You can only watch Betas if you're an Amazon Prime subscriber. Is it (to keep the Silicon Valley motif going) the killer app for this service? Not yet. But if you are a subscriber already, you should be watching. It's no-holds-barred sitcomedy against a backdrop of safe and banal network comedies that would never dream of challenging the rules and formulas Betas gleefully and confidently undermines. To find out why a Nerds of a Feather "8" would be even higher on other sites, check out our scoring system here.